Create a bird haven on your deck using the Stokes Deck Pole Kit with Branches. Faux branches and leaves on a main shaft bring a natural element to your deck rail in moments. The 37" tall main shaft has a clamp at the bottom, and attaches to horizontal deck rails from 0.75" to 2" thick with its convenient hand knob. For added strength, insert a nail through the pilot hole on the clamp onto your railing. The branch hangers may be added and placed individually, secured with thumbscrews for the perfect height for your items. Each arm ends with an inward curl, to easily hold your bird feeder or flower basket, and the slightly curved shape of them adds a touch of realism. Metal leaf shapes adorn each arm for more interest, and the rods offer birds a place to perch and rest after dining. A metal bird silhouette rests at the top of the hanger, hinting at the item's purpose. 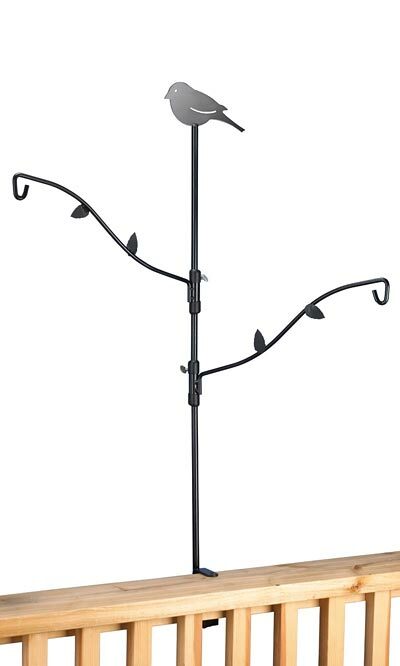 The sturdy, recycled steel construction forms a lasting hanger, and the classic black finish offers weather resistance. Place your bird feeders conveniently near your home with this Deck Pole Kit with Branches.